Are There 'Better' Ways to Kill Dolphins? Bottom line: I just don't buy the argument that humane killing is better. It doesn't stop the killing; it just condones it. A new study by four scientists is arguing for more "humane" ways of killing the dolphins at the annual Taiji massacre in Japan. 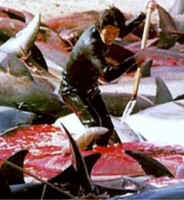 (That's the massacre that was portrayed in the Oscar-winning movie The Cove.) What they are saying could set back the entire movement to bring an end to this horror. Here's why. Two years ago, the dolphin protection group Atlantic Blue captured video of the latest way of killing the dolphins in the cove: driving a metal rod into to the top of the spinal cord, thus paralyzing the dolphins, then plugging the wound so there won't be so much blood in the water. This killing method does not conform to the recognized requirement for “immediate insensibility” and would not be tolerated or permitted in any regulated slaughterhouse process in the developed world. There thus appears to be no logical reason to accept a killing method that is clearly not carried out in accordance with fundamental and globally adopted principles on the commercial utilization, care, and treatment of animals. In other words, they basically advocate not for the end of the massacre at Taiji, but for a more "humane" way of conducting it. Reiss is interviewed by Andrew Revkin of the acclaimed "Dot Earth" blog, where she says, on the one hand, that "dolphins are a cognitively and socially complex species that exist in their own societies in the seas" and, on the other, that "the methods used to herd dolphins and then kill them is off-the chart in terms of any concern for animal welfare." But what goes on at Taiji is not about "methods"; it's about murder. How do they reconcile, what they're saying in their new paper, which is about "methods" of murder, with the declaration that "every individual cetacean has the right to life? This takes us back to the classic debate of animal welfare vs. animal rights. Animal rights advocates are basically abolitionists. We say there's no such thing as "humane slaughter." Killing is simply wrong. Animal welfarists, meanwhile, work for incremental change – like in the efforts of the Humane Society of the U.S. to press for better conditions at factory farms and more humane ways of killing the animals. I realize that some people want much more action and they want it now. They are frustrated by the slow progress that is being made on the egregious and thoroughly unethical and inhumane murder of these amazing sentient beings. ... [But] those who share common goals must work for the animals and not against one another. There really is strength in numbers. I would ask the authors: Exactly what is the appropriate way to kill a dolphin? You are right – the dolphins need all the help they can get. And what they do not need are so-called dolphin advocates implying that the problem with Taiji is that they are not killed according to the same standards used to kill farm animals. ... This paper takes us ten steps backwards and, in my opinion, is inexcusable. I agree. And I compare the massacre of dolphins to the death camps of Nazi Germany. Half of my own family perished at Auschwitz, and the idea that people supposedly trying to help them might have come along with the compromise plan that they should be killed according to some kind of "globally adopted principles" would be abhorrent. The idea that people supposedly fighting slavery might settle for better conditions for the slaves is abhorrent. And it is, to me, equally abhorrent to take anything less than an abolitionist position in relation to the murder and enslavement of any nonhuman animal. Let those who kill and enslave the animals and who want to appease the animal protection movement negotiate with themselves by finding more "humane" ways to kill. Perhaps, if I were one of the dolphins at Taiji or one of humans at Auschwitz, I'd prefer a quicker, easier way to be killed. But either way, I'd be dead. Come to think of it, if I understood that in going along with that I'd just be helping to legitimize yet more murder, I'd rather go out painfully and have it on video. At least I'd know that my death might make a difference.